Mr Jenkinson's predecessor, Jeff Fairburn, left last year following controversy over his £75m pay package. "We are the first company to make over £1bn profit in this sector," Mr Jenkinson said. "The whole team are very proud." 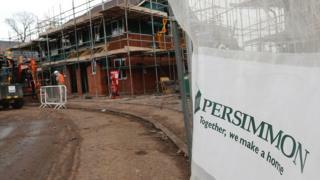 The results come a day after shares in Persimmon fell 5% because of questions over its continued involvement in the Help to Buy scheme. 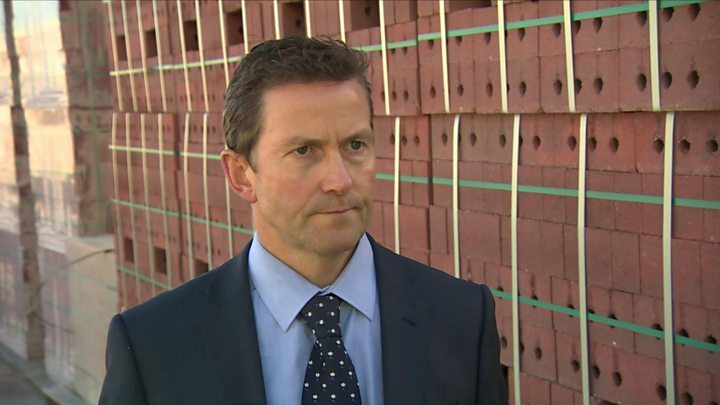 At the weekend, a source close to Housing Minister James Brokenshire said the minister was "increasingly concerned" by Persimmon's practices, including its use of leasehold contracts, the quality of its buildings and its leadership. And housing expert Henry Pryor told the BBC: "There is no doubt that Help to Buy has been the crack cocaine of the housing industry. We've all got addicted to it and when we are weaned off it, it is going to be painful." The Persimmon money machine rolls on, profits past the £1bn mark and £2.2bn returned to shareholders in the past seven years, with the promise of more - much more - to come. Jeff Fairburn, the former chief executive, had to fall on his sword after public and investor opinion swung sharply against the size of his remuneration - £75m, although he gave some to charity. There was a hint of that in weekend reports that Persimmon's participation in Help to Buy was under government scrutiny - a hint strong enough to send the shares down nearly 5%. Mr Jenkinson has been with the firm for 22 years and had been interim chief executive since November, following Mr Fairburn's departure. He said: "2018 has been a year of disciplined high quality growth again for Persimmon Homes. "We have a lower average selling price than our competitors, but that is a function of our desire to hit all parts of the market." He added: "It is important for me as the new CEO to acknowledge that we still have work to do in customer care." Chairman Roger Devlin said: "Persimmon is changing. In his short time as interim CEO, Dave Jenkinson has introduced new approaches to customer satisfaction and colleague engagement, whilst also ensuring that the group delivered another year of growth." The company's total group revenue for the year increased by 4% to £3.74bn, up from £3.60bn in 2017. Sophie Lund-Yates, equity analyst at Hargreaves Lansdown, said: "Conditions are about as good as they can be, with low interest rates, record low unemployment and helpful government schemes like Help to Buy all helping people get on the property ladder. "With Persimmon's participation in the Help to Buy programme under heavy scrutiny, following its former use of controversial leasing fees, and poor quality builds, these conditions have to end at some point." Looking ahead, the company said in its results statement: "Whilst sales expectations remain subject to a degree of uncertainty at the start of any financial year, the lack of clarity with respect to the UK's exit from the EU is currently creating additional unpredictability." It added: "We have worked with our suppliers to identify any material supplies which may be exposed to some disruption to availability as a result of Brexit and we are working with them to adopt appropriate mitigating measures."